SWORD & SHIELD: Pocket Full of Peril #9...Now available, and corrected! Pocket Full of Peril #9...Now available, and corrected! As promised, since the Halloween adventure book fell through, here is the first in a new weekly series of Pocket Full of Peril adventures for October. 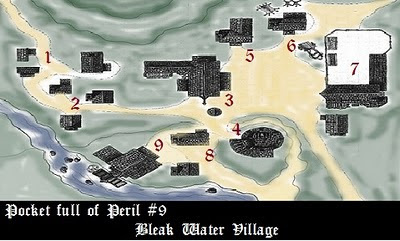 This Village map is actually from STONEWERKS blog. It's a killer blog I have pulled lots of maps and inspiration from! I visit it a lot...but its been awhile since he's posted so hopefully we will see more soon! Maybe I can use some of his stuff to do a Far Trek Episode of Intruigue series? I still recommend highly Dyson Logos site! I recommend you bookmark both sites and visit them often, lord knows I do! Bleak Water Village is something a bit different than previous PFoP adventures. 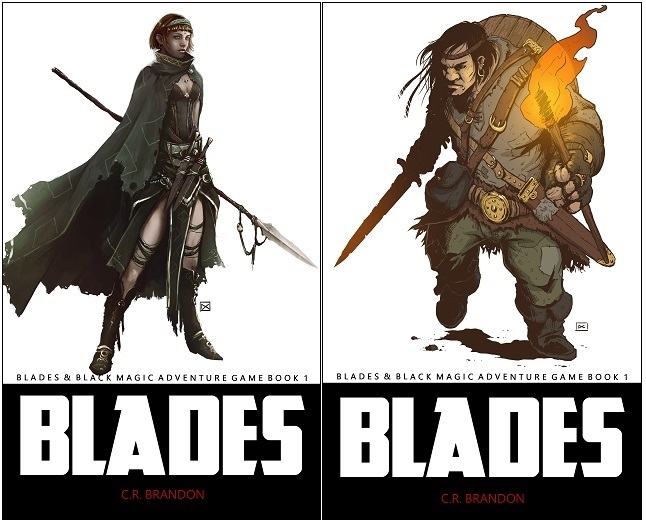 Now you have a setting and I think (unlike a dungeon romp) it could lead into a larger adventure possibly. Play it and see what you make of it. You can download it to your right, along with the previous 8 adventures. For those new to it, Pocket Full of Peril adventures are index card sized mini adventures which give you a skeleton script to start you, and a lot of flexibility to add, change, and to make it your own. Drop them on your map wherever or use as a one night adventure. You have to do some work to use them like figuring out spells for the wizard or full stating the opponents, but there is enough there (I think) to give you a springboard and room for creativity. Anyway, I hope you dig it and my apologies again to AJ @ Stonewerks for mis-attribtuing his "werk" on the original post. Great to see more PFoP!! a crazy quick 1 hr. session. @DD-Thanks man, glad you are getting some use out of these!